The honey bee is a social insect. They communicate with each other in species specific manners, which are not observed in other insects. They use several kinds of senses for their communication. Especially sound, including vibrations, and odors (pheromones) in the complex communication of honey bees have been clarified to have critical roles. When foragers of honey bees find a nectar source and come back to their hive, they perform a characteristic dance on perpendicular surfaces of the hive to communicate the spatial information of the nectar source to their hive mates. This is often thought as an example of instinctive behavior. The dance translates information on the location of the nectar source into abstract information in the dance. Therefore, it has been believed to be a form of symbolic communication. Karl von Frisch, who discovered the waggle dance, shared the Nobel Prize in physiology and medicine with Konrad Lorenz and Nikolaas Tinbergen in 1973 for their discovery that insects also show high level of communication ability. The bee indicated by the arrow is the waggle dancer. If the food source is nearby, the dancer turns in circles, alternating right and left while waggling her body, it is names as “Round dance.” If the source is far from 25 to 100 m, [von Frisch, 1967] the dance transit from round dance to tail-wagging dance. The shift is gradual depending on the distance to the food source. At 50 m, the waggle runs tend to be remarkable on half of the dancers and at 100 m the tail-wagging dance is dominant. Such tail-wagging dance moves in a repetitive “waggle, right turn and return to start, waggle, left turn and return to start” pattern or “figure of eight” dance (the waggle dance, Fig. 1). In this case, the angle of the waggle run against the opposite direction of the gravity shows the angle to the indicated flower against the direction of the sun. For example, if the dancer waggles in a horizontal right hand direction from the top of the hive surface, this signals “fly with the sun 90° on your left.” The number of pulse of waggle correlates linearly with the distance from the nectar source. If the number of pulse caused by wingbeats during waggle run is low, the source is nearby; a high number of the pulse indicates a distant source. It is clarified that air-borne vibration caused by wingbeats has a functional role for informing the distance to the hivemates and are detected by Johnston’s organ on the antennae. Several bees that follow-up on the waggle dance will leave the hive to collect nectar or pollen, but not necessarily to the food source indicated by the waggle dance. It suggests the waggle dance has roles not only for informing the spatial information but also for recruiting to foraging. Before or after waggle dances, the dancers present a small sample of the nectar to the followers to enable them to recognize the scent of her giving nectar. Similar dances are performed also as communication for the place of pollen, waterand the new nest. Bees perform the tremble dance frequently inside the hive, and it is believed to be a way to recruit bees for foraging. This dance was first described by Karl von Frisch in 1920, but there was little interest in this dance until recent years. This dance is performed in the hive by foraging bees when there are few bees receiving the nector as nector storage or when the forager collecting nectar takes a lot of time for looking for the nector storager. This dance also occurs where there is too much congestion around the nectar source. Worker bees emit a sound consists of single syllable or intermittent syllables with 200–600 Hz for 100 ms. . This is called Worker piping. The bees that perform worker piping have a tendency to perform the tremble dance. The role of this behavior are provided below. stop signal: This signal is sent by the followers of waggle dancing to the dancer. This is thought to have an effect of discouraging recruitment to the nectar source indicated by the dancer. begging signal: This signal is used for the hivemates to beg a nectar sample to foragers that have returned to the hive after foraging. The queen of European honey bee colonies emits a series of a few to several hundreds syllables with 450 Hz . This is called Queen piping and is categorized into 2 types, Quacking and Tooting. Quacking is performed by virgin queens on the queen cell. After the virgin queens have emerged from the queen cell they often perform Tooting. To perform tooting, the queen stops walking, push the thorax against the hive with closing the wings and contract the thoracic muscles, which makes the resonance sound in the thorax, thereby producing an extremely loud sound. [Seeley, 1995] Because Piping occurs when there is more than one queen in the hive, it is thought to be an aggressive behavior against the other newly emerged queens and to make the colony workers recognize as the new queen. In contrast, the Quacking sound is emitted by queens who are prevented from getting out from the queen cell and is anopposing aggressive behavior against the queens who have already got out from the queen cell. 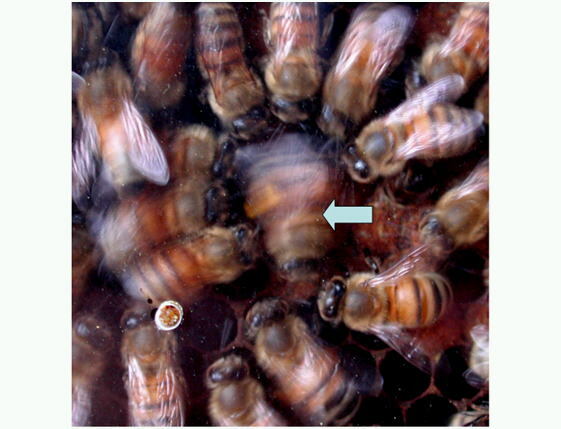 This is a defense behavior unique in Japanese honey bees. In case of appearance of enemies or there is a substrate vibration caused by invasion in the hive, most worker bees in the hive waggle from left and right and these movements spread out from the source (i.e. the honeybees most close to enemy or noxious vibration) in a wave-like pattern. The transmission mechanism is unknown. Social insects maintain their society by chemicals known as queen substances and substances for differentiate the labor states. The queen substance, which is secreted from the mandibular glands of the queen, suppresses ovarian development in other females and induces worker specific behavior (nursing, cleaning and foraging etc). If the queen dies, the supply of this substance stops, and the workers provide a special cell for new queen. This is released from the Nasanov gland when bees locate high value food sources such as profitable flowers. It has the effect of calling hive mates. This informs hive mates about the presence of enemies outside the hive. It is secreted from the sting glands and contains isoamyl acetate. The aggregation pheromone assists bees outside the hive to find their way back by attracting them to the hive. It is secreted by the Nasanov gland.